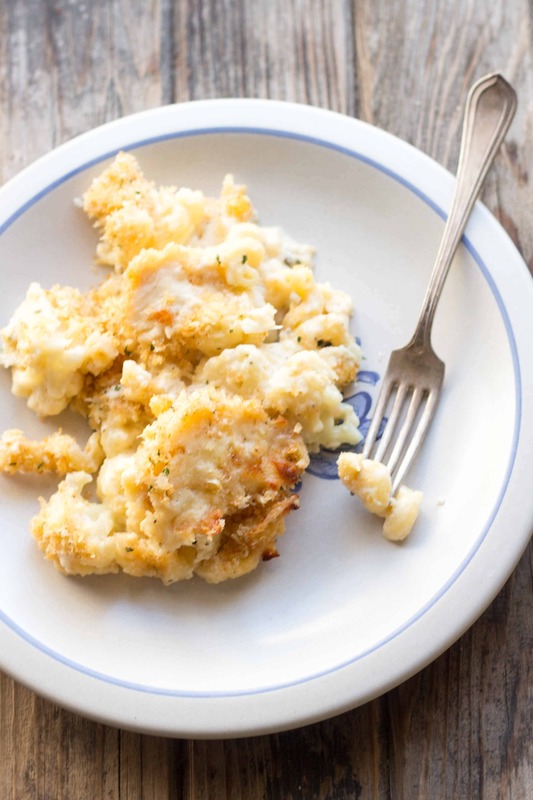 This recipe for cauliflower mac n cheese is like a mashup between the best mac n cheese and cauliflower au gratin. Perfect recipe for feeding a crowd! 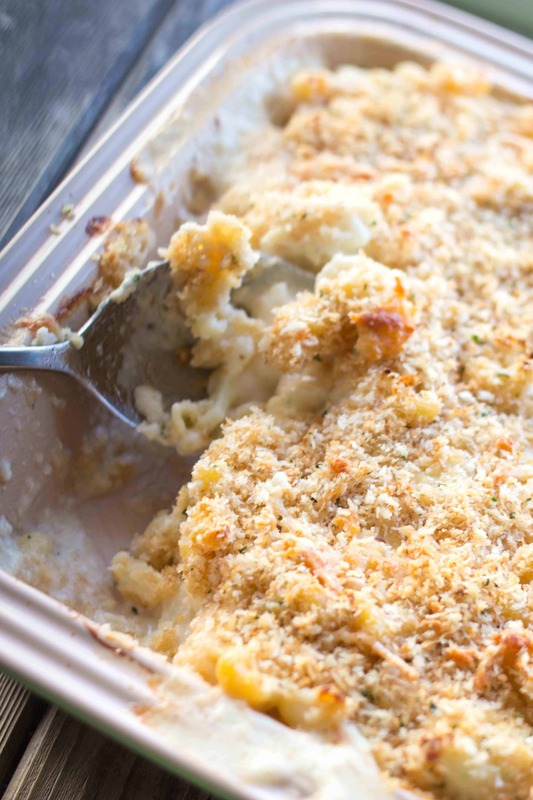 Macaroni and cheese tops nearly everyone’s list for a meal they’d be most likely to snuggle up with on a bad day. It’s a universal comfort food we can all get down with. I actually grew up not being all that fond of mac n’ cheese. Crazy – I know. To this day it’s something I really question about myself. But just like most other foods I swore off as a kid, I’ve come to adore a dish of baked cheesy noodles just as much as any other self respecting American. It was, in fact, this recipe for mac ‘n cheese that ultimately lead my tastebuds from passiveness to borderline obsession. Many years ago, Martha Stewart’s recipe for “Perfect Macaroni and Cheese” took the blogosphere by storm, being copied everywhere from here and here to here and here. And it’s for good reason. The word “perfect” is used in a most appropriate fashion: You’ll be hard pressed to find a better version anywhere. Why? It’s freaking l-o-a-d-e-d with cheese. Good cheese. Barefoot Contessa approved gruyere, pecorino and the sharpest of all sharp cheddars. It’s saucy. Real saucy… metaphorically and literally speaking. And it’s topped with crispy, buttery bread cubes that provide the most welcome contrast to all that soft, gooey goodness below. If you haven’t yet tried Martha’s mac n’ cheese, do yourself a favor. Skip this one and run, don’t walk, to go make that one immediately. It is a mandatory prerequisite in your mac ‘n cheese 101 curriculum. After years of making this recipe verbatim, I started experimenting with different variations and came up with one I now make more often than the original. In order to lighten up the recipe without sacrificing flavor, I swap out half of the pasta for a whole head of cauliflower. What results is a dish that’s strikingly similar to the original, but one I find even more enjoyable knowing there are lots of cruciferous vegetables hiding amongst the cheese. The cauliflower literally gets lost in the sauce. It’s so inconspicuous and sneaky, it fools children and even the biggest carnivores into devouring every last bite, as the cauliflower is nearly indistinguishable from the pasta. Tis the season for feeding crowds. The abundance of holiday gatherings on the horizon requires an arsenal of recipes that are easy to make ahead of time and always please a crowd. 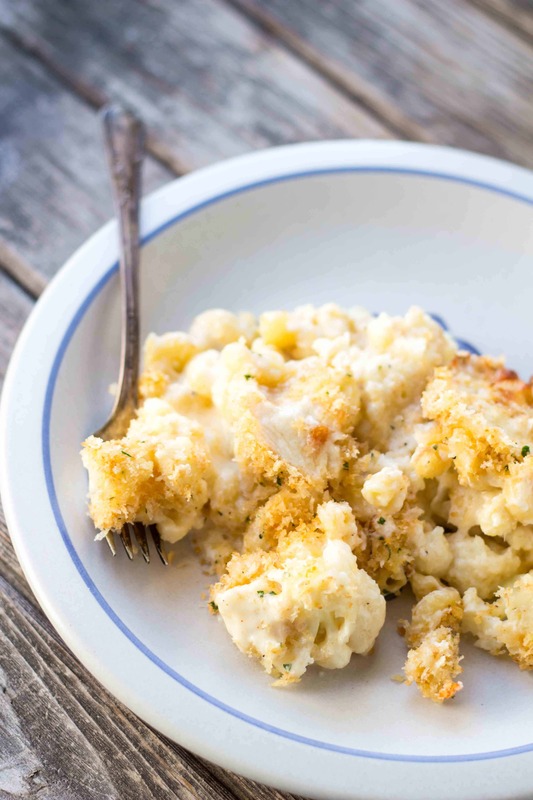 This recipe for cauliflower mac ‘n cheese was on my menu last Christmas Eve and is likely to be again this year. It’s warm, filling and decadent, while being just healthy enough to not feel bad about eating a few extra cookies (or cocktails) after dinner. This is a meal that satisfies both meat eaters and vegetarians alike, which is important in my family since we have a healthy mix of both. Don’t have a big crowd to cook for this year? This recipe can easily be cut in half (using only 1/4 lb of pasta!) to feed a smaller squad. Just be mindful about leftovers. You definitely want them. 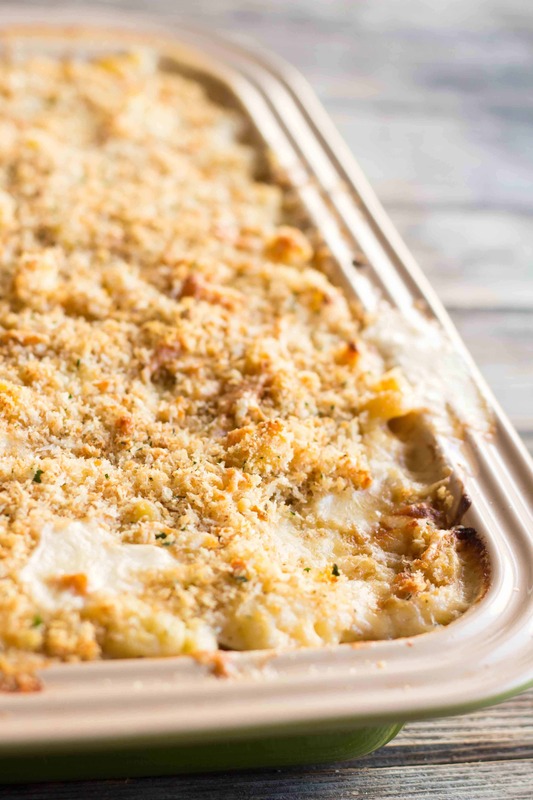 This recipe for cauliflower mac n cheese is like a mashup between the best mac n cheese and cauliflower au gratin. Perfect recipe for feeding a crowd! Adapted from Martha Stewart. Melt the butter in a large skillet over medium heat. Add the breadcrumbs and garlic, then continuously stir and toss around until evenly golden brown, about 5 minutes. Transfer to a bowl and allow to cool. Once cool, stir in the pecorino Romano and parsley and set aside. Preheat the oven to 375 degrees, butter a 3-quart casserole dish and set aside. Fill a large pasta pot with water and bring to a boil. Heat the milk a medium saucepan set over medium heat. Melt the butter in a large saucepan, then add the flour and stir for about 1 minute. Slowly pour in the hot milk while vigorously whisking. Continue whisking until the mixture bubbles and thickens, about 2 minutes. Remove the pan from the heat, then stir in the salt, nutmeg, black pepper, cayenne pepper, and all but 2 cups of cheese (a mixture of all 3). When the water is boiling, drop in the pasta and cook for 6 minutes (set a timer). Add the cauliflower into the water with the pasta, stir, and cook for another 3 minutes. Drain the pasta and cauliflower well, then combine with the cheese sauce. Pour the mixture into the prepared casserole dish. Sprinkle the remaining 2 cups of cheese, then scatter the breadcrumbs on top. Bake for about 30 minutes, until golden brown and bubbling on top. Allow to rest for about 5-10 minutes before serving. *This dish can be made up to 3 days ahead of time without being baked. Cool, cover and refrigerate until ready to cook. Heat in a 375 degree oven for about 30 minutes, or until bubbling and browned on top. OH…. MY!!! I LOVE that you cut down the pasta with cauliflower. I think I may to sneak out of work this afternoon to get some cauliflower and Gruyere… I don’t think I can wait until tomorrow to make this! Thanks, Coley… for another WINNER!! I just made this for my chosen sister’s annual Christmas party… I can’t tell you how many compliments I got from this dish (I didn’t change a thing – SO unlike me!). The only thing I did (or didn’t) do was accidentally NOT spread the extra 2 cups of cheese on top before putting the bread crumbs on (my bad). I totally spaced about the extra cheeses that I had on the side (was making Steak on a Stick at the same time and my kitchen was a little crazy at the moment. I put the cheese on top of the bread crumbs so when it started to cool out of the oven, the top got hard… but people loved that, too! Who was I to tell them otherwise?! I told them to go to your site to get other wonderful recipes, too, Coley. Wonderful dish… even if you mess it up! Yay! This makes me SO happy to hear. 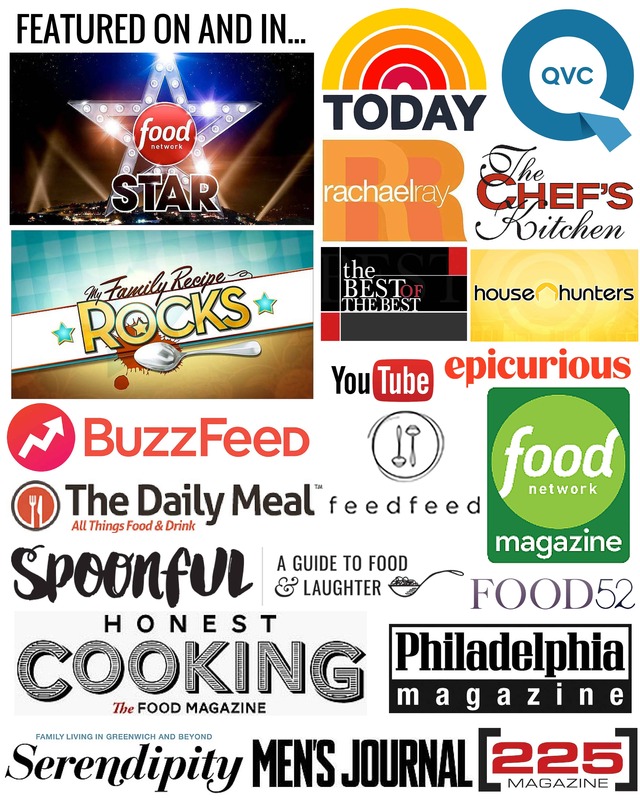 I love when my recipes are big hits! As for the cheese debacle – I can’t tell you how many times I forget to put 2 cups of cheese aside for the top and mix it all in with the sauce – it still comes out fantastic. This particular time, I did exactly what you did kept two cups to the side, but then forgot to put it on top before the breadcrumbs. I realized right as I was about to put it in the oven, so I pulled off as many bread crumbs as I could, laid on the cheese, and then piled the crumbs back on top. You can sort of see in the pictures, but I actually like how it let the melty, gooey cheese shine through! this looks amazing! I bet you can’t taste the cauliflower either! I knew Coley would never go for some vegan/gluten-free “mac ‘n cheez”! Healthier, but still lots of good cheese and crispy breadcrumbs! mmm. I love cauliflower and it has been a while, so I will be eating this soon. Haha, totally! This is more like a mac n’ cheese / cauliflower au gratin hybrid. It’s SO good!